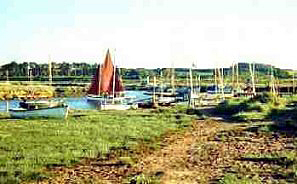 The Peddars Way and North Norfolk Coast Path, running from Knettishall Heath near Thetford up to Holme-next-the-Sea, then taking an abrupt right-hand turn for Cromer, are joined together to make one National Trail of around 95 miles in length. We like the North Norfolk section of this so much that we have done it twice so far – left to right, or Hunstanton to Cromer both times – and are considering the possibility of doing it the other way around. Our first attempt was in July 1992 and it was the first long-distance walk we had ever done. 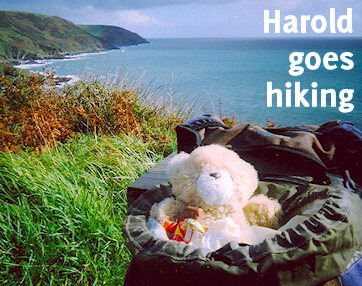 We have a vague memory of not even bothering with waterproofs, and we thought it was a cool to idea carry camping equipment – a notion that was knocked out of us more or less on the first day we set foot on the South West Coast Path and encountered hills. And we hadn’t had much practice of working out sensible stages either. But we did manage to get ourselves to Cromer without too much unseemly incident. Our second attempt was at Easter 2001 when our progress on the SWCP had been rather badly held up by a combination of vertigo and foot-and-mouth restrictions, so we were pretty keen to get out there. We chose Norfolk again because we wanted something that we could conveniently fit into four days, including travel. And it was every bit as nice. This path is not the Pennine Way – in the literal sense that it’s in Norfolk not Yorkshire, but also in that it is not one of the country’s epic walking challenges. No, its attractions are far subtler. If you’re the kind of walker that is only happy putting in 20-mile bursts then you need to combine it with the Peddars Way and see if you can set a speed record. So don’t make the mistake of underestimating this path. It’s a great walking experience.